Rob Atlas is a photographer who specialises in still life images and who's work shows an absolute mastery of light. His site contains a number of very inspiring images, well worth a visit. Judging from the constant barrage of emails I receive, for many of you hardly a day goes by without you wondering how I am doing with my new years resolution. Well here is another instalment. Last week I visited the area around Lloyds of London to get myself a few shots of the new Willis Building. Unfortunately its still surrounded by hoardings at the ground floor level, so I had to content myself with what shots I could get giving the beautiful sweep of this building. After that I decide to try an abstract of a nearby tower. and then tried to capture the hustle and bustle of the city. I have been thinking about Paul Indigos interesting article on the almost lost art of composing Full Frame. If you haven't already read it, why not pop over and read it now - its OK I'll wait. "Cropping both the longest and shortest sides of the frame is in my book almost sacrilege and to be avoided at all costs." I have been trying this for a while and have noticed that the viewfinder on my camera actually doesn't show me all of the image that is actually recorded. Sometimes a little all-round crop is needed to get what I actually saw through the viewfinder rather than something with the corner of a leaf poking in. High Dam - Composed full frame but a leaf on the right cropped out. It seems to me that a lot of photographers are looking for a set of rules to use in taking photos: Subject must be on the thirds, horizons must be straight, no work should be done in photoshop, you should compose full frame, etc, etc. Personally I feel it is quite a sterile idea to tie yourself to a set of arbitry constraints that are dictated by photography magazines and books in the hope of producing a shot that is "perfect". Instead these disciplines should be looked upon as ways to fire your creativity. Composing full-frame forces you to think more about the image you are producing and exactly what elements you want in the picture. In the same way working with a prime lens increases the amount of thinking you have to do when you are trying to get the picture compared to a zoom. Work full-frame with a prime and you have a challenging yet enriching experience. I have always been surprised that I often produce my best images when I have the "wrong" lens on the camera as it forces me to go for shots that arn't the obvious, clichéd shots...that's why the 100mm macro is my favourite "walkabout" lens...it just makes getting the shot a bit harder than a zoom would. I was interested to hear at a talk by on of the Magnum photographers (sorry the name escapes me at the moment) that he found having the wrong lens on spurred him towards more creative images too. In fact he was taking it further; for a recent series of images, rather than lug a whole lighting rig with him he took just a single light and all shots were taken within a flex length of a plug socket. The constraint forced creativity or as they say these days - less is more. As an antidote to all this prime lens/full frame/hair shirtism, don't forget that you can always give yourself permission to crop - there are really no rules, just what works for you. Over at The Luminous Landscape is an interesting discussion about the curves that are used by Adobe Camera Raw and Lightroom. Having gone to the trouble of learning how curves work in photoshop and Capture 1 I have always foud the system used in Lightroom and Camera Raw rather confusing. I look forward to working out how its all supposed to be used. I have just become really privileged to get my hands on a copy of Bill Atkinson's book of abstract rock images "Within the Stone". The book is a real thing of beauty with amazing images jumping off every page. The other feature of the book is the remarkable print quality, the purity and vividness of the colours take the breath away. Bill is a colour management guru and he apparently spent a lot of time working with the printers to develop new techniques that represented the colours in the original images perfectly and boy does it work! To be honest I'm not sure that someone like me who regularly breaks the spines of books and folds over page corners to keep his place should be entrusted with such a precious thing but I will be on my best behaviour with it. 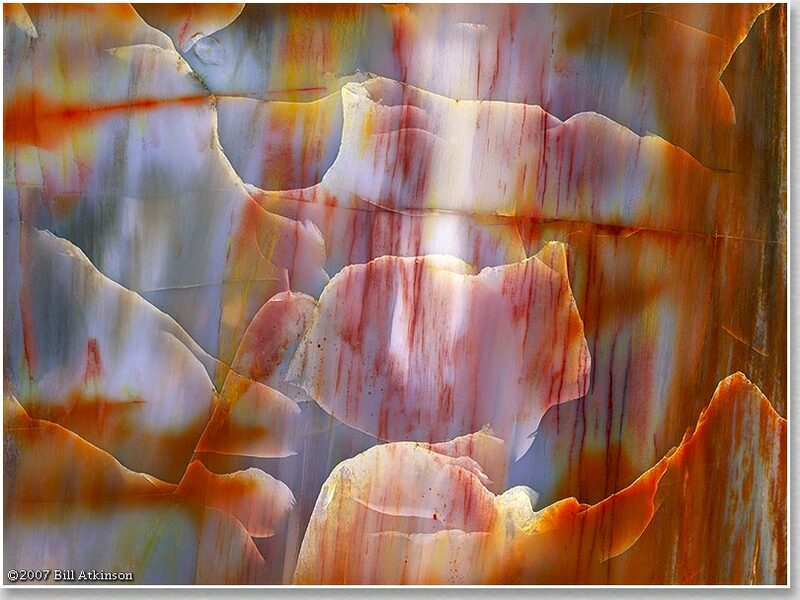 Recommended for all fans of Abstract photography, fine art photography and great printing. If you are in the US you can get a signed copy from Bills Site unfortunately he doesn't ship abroad but in the UK you can get it from Amazon: Within the Stone: Nature's Abstract Rock Art. I've just got back from a great week in The Lake District, whilst the rest of Britain was being hit by torrential downpours the wettest place in England was pretty dry! I did have one disaster though, like an idiot I placed the camera in the top of my rucksack without doing up either the camera case or the rucksack. A short while later I went to remove the rucksack and the camera and lens (Canon 20D & 17-85EFS) went crashing from shoulder height on to the concrete carpark. It made a horrible smashing noise...Eek! On investigation it seems the only damage was to the battery compartment door which had flown of and exploded and the rear LCD has been knocked out of alignment. I but the battery compartment door back together easily enough but a tiny spring has gone missing so it doesn't always stay shut. Other than that the camera still works and the lens is as sharp as ever. Quite frankly I'm amazed how strong the camera and lens are - top marks to Canon for building such strong kit. Wasdale Head - The last shot I took before I threw my camera at the floor! Following on from the previous post about image theft, I got a mail from a friend (hi Steve) asking what you could actually do to protect your images from theft. Its very much like protecting your home from burglars, you can never really stop a determined thief but you can slow them down and make things more difficult so that they go somewhere else. David Riecks has produced a very useful list of possible image Protection Methods, I hope you find it of use. As we haven't had a photo for a while - here is a shot from my recent trip to Cornwall. Its not an uncommon event for people to steal images of photo sharing sites and pass them off as their own work. Usually it is just a kid who enjoys getting the adulation from their piers on the site. They are usually caught out by other photographer who notice a sudden improvement in the quality of their work or just recognise other peoples shots. Whilst annoying for the photographer who actually took the shots, the disruption doesn't last long as most sites have staff and moderators who are well experienced in dealing with this sort of thing. But today Paul Indigo brings us news of A stolen picture winning a prize in a photo competition. The brazen cheek of the thief involved is amazing - how did he think he would not go undiscovered. It begs the question how do you prove that you took a particular image? All I can recommend is that you keep hold of your raw files and make sure they are backed up and archived so that you can get your proof if you need it. Stephen Baker, the same member of the Fuji website has stolen yet another photo from Trekearth and used it in the current Fuji competition. The photo belongs to TrekEarth member: Antonio (aznegrao) and the photo is named 'The Capoeira'. Stephen Baker has posted the photo on the competition entry page as seen on the Fuji website. Yesterday I posted this shot on ephotozine and received the comment that, on the lower landing the floor appears a bit messy and would be improved by a bit of cloning. I agree entirely that as an image, the shabbiness of the landing rather distracts from the repeats and curves. But should I get out the clone tool and produce perfection? The subject of the picture is the Nelson Stairs in Somerset House. The stairs are a very fine piece of architecture, but when I visited them they had quite a worn look and it was really rather difficult to see any part of it that didn't have a bit of damage to them. I composed this shot very carefully to avoid bringing in any of the distracting modern elements - electric lights, fire exit signs and people using the stair case. But I still could see some of the damage to the staircase in my shot and for me this is the deciding factor on whether to clone out elements of a picture or not. If the image represents what I saw or felt about the image at the time I took the shot then I am happy to leave it as it is. If I take a landscape shot and on examining it later, I notice a coke can in the corner of the shot I am happy to clone it out as it doesn't represent what I saw at the time. For me photography is about capturing a specific moment or feeling and not creating something in the computer afterwards - though if that is what people enjoy doing I have no problem with that. OK, it's a prepared studio shot with a model but to me the fact that there is one stray hair on the side of her face destroys our perception of this being a "perfect shot" yet at the same time roots the shot in reality rather than simply being a "painted mask of ugly perfection"*. It is so easy to produce a photoshopped version of reality that many photographers become seduced by it but I urge you to think before you reach for the clone tool next time. What is your personal limit when it comes to manipulation? I'd love to hear some other opinions on this - please use the comments option to add your take on the nature of photoshop & reality. I know that for many of my regular readers, hardly a week goes by with out them thinking to themselves "I wonder if Chris is sticking to his new years resolution ?". So I thought it was about time for an update. Well it has been a mixed bag: Friday was not the best day to choose, because its not unusual to have to sort out something in preparation for the weekend, so some days got missed. Combining that with loosing so much time to sickness in May, I don't have anywhere near as many shots as I would hope for so I am going to attack the project again with renewed vigour. On the plus side it really forces me to take pictures that I would otherwise not even thought about taking. Last week I popped over to the South Bank to investigate the Anthony Gormley statues that have invaded the place. I must say that I really enjoyed the sculptures, its great to spend some time looking round for them trying to spot each one. Whilst I was there I observed many people being delighted & surprised as they discovered more and more of the sculptures. Quite often there were 3 or 4 of the sculptures in view at anyone time which provides a whole new dimension to the cityscape, adding a human dimension to a view that can sometimes seem vast and soulless. I'm not sure how long they will be staying on The South Bank but I hope that they stay for a long time. Just lately I have been doing an awful lot of training with people and I have often emailed them a quick summary (a cheat sheet) of what they have learnt. I thought I would stick it here so I can get to it when I need it and it might help folks. Definition - "the amount of an image that is acceptably sharp"
Increasing the f number (decreasing the size of the aperture) increases dof. The longer the focal length of your lens the less dof you have. The size of the hole you are taking the picture through - the bigger the hole the shorter the shutter speed. Its a fraction so the higher the number the smaller the hole. When you look through the viewfinder you see it wide open (lowest f number). Dof preview shows you the effect of aperture. Increasing the f number in a given situation increase the shutter speed. The rule of thumb for hand-holding is that you can hold at a shutter speed of 1/the focal length. So a 100mm lens can be held at 1/100th of a second or faster - i.e. the number at the bottom of the display should be 100 or greater. Shutter speeds followed by “ are in seconds - you ain’t going to handhold those whatever lens you have on! Increasing the iso increases the sensitivity of the sensor (film) and so means the exposure takes less time. ISO 100,200 & 400 are virtually noiseless. After this noise starts to increase. Shows the distribution of light in your image from black on the left to white on the right. An evenly distributed graph is generally ideal. Peaks at the extreme left indicate blocking up of the shadows, peaks to the extreme right (and flashing highlights indicate burnt out highlights. You can either recompose or use exposure compensation to correct. If your in London at any time between the 2nd July and the 9th of September why not pop along to a new exhibition by Francis Aliefeh at The Oxo Tower. The Seeing Group are a group of 8 nature photographers from the South East of England who consistently produce the most outstanding Natural history images. This website has been set up to display wildlife and Nature images of Britain from a group of photographers who wish to put something back into the wildlife conservation efforts of our various charitable Trusts. To achieve this, the photographs on this website are available Free of charge to registered charities and Organisations working in the spirit of Wildlife conservation and education for use in their media. All other use will be charged at commercial rates. Great to see nature photographers respecting their subjects and giving back to the groups who look after them.